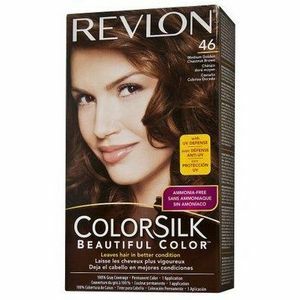 Love Revlon Colorsilk Hair Color! I went out looking for a new hair dye to give myself a new little makeover when I stumbled across Revlon Colorsilk Hair Color. I also love how vibrant the color turned out and how long lasting the color stay is. Dark Mahogany Brown was the perfect color for me. Thanks Revlon for such a great product! I have used this product for years! Not expensive but works just as well as other more expensive products. always get the same color I want. Conditioner is great! Leaves my hair soft and silky.......just wish there was more. This is my favorite at home hair color. It is easy to use, super affordable, and I always get great results. My hair always looks healthier after I use it instead of "fried". I am a loyal customer. I highly recommend. It leaves a nice shiny, healthy look to my hair. I got this to cover up my gray hair & wanted to try a new color. I got it in the shade Dark Auburn. 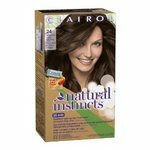 It was a great price, around $3 a box(I had to get 2 since my hair is so long). It was very easy to use. You just snip the end off of the developer bottle & pour the color in it, then put the top back on & shake it for a few minutes. Make sections in your hair & apply. I left mine on 40 minutes. When ready to wash out, just wet it with a little warm water, lather it up, & then rinse until your water is clear. This didn't smell like ammonia & the smell didn't burn my eyes or nose like some hair dyes. Once dry, my hair was so soft & the color was really pretty. The only negative is that the color fades within a few weeks. Overall, I really like this hair dye & would recommend. Not for natural Red Heads! I used the Revlon medium brown (41). I was excited to Revlon the bring out a hair dye, but to my dismay I used it and it didn't take that well, so I re applied it and still not a 100% coverage. So disappointed. For all those natural red heads out there, this product will not cover the red. 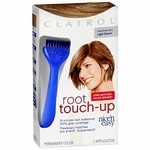 This hair dye works great and gets rid of all my grays while it gives me the hair color results I want. 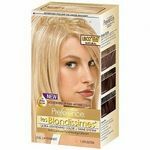 I don't have to pay a lot for a product that will give me a deep color that lasts a long time with this hair dye. 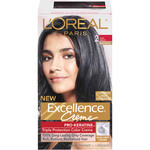 I like this hair dye because it does not dry out the ends of my hair like a lot of other hair dyes do. Effectiveness I always get great results with this hair dye and the deep color of my desired hair color and covers my grays without drying up the ends of my hair or my roots. Ease of Application I like that this hair dye kit comes with everything I need to dye my hair and get the exact results I was looking for. The kit even comes with gloves for me to use and a simple very easy to understand set of instructions. I simply add two ingredients together in the provided bottle and apply and wait the amount of time specified and rinse out well. 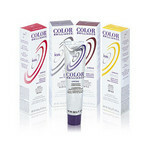 With the ease of this hair dye kit I get deep color and say goodbye to all my grays.